Check the pericardium, open it and explore the pericardial cavity. Check the anatomy of great arteries before transecting them about 3 cm above the aortic and pulmonary valves. Check and transect the pulmonary veins. Transect the superior venacava about 2cm above the junction of the crest of right atrial appendage and superior venacava (to preserve the sinus node). Transect the inferior venacava close to the diaphragm. Remove the heart from the body. Before beginning the dissection of heart, serial transverse transection at about 3mm intervals along the course of the main coronary arteries i.e. Left anterior descending artery, Right coronary artery and Left circumflex artery is performed using scalpel to visualize their patency. The obstruction of the coronary arteries can range from mild/grade I (>25%) to severe (70%) to critical/grade IV (>90%). Open right atrium using scissors, from the inferior venacava (IVC) to the right atrial appendage. Spare superior venacava and SA node. 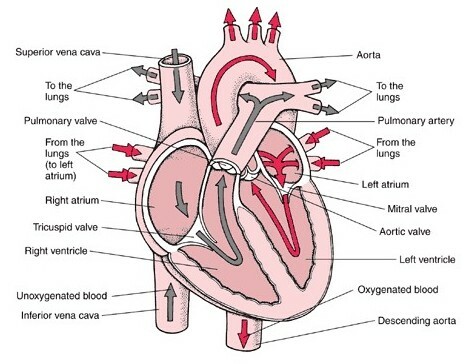 Examine the atrial cavity and septum along with the atrioventricular valves. 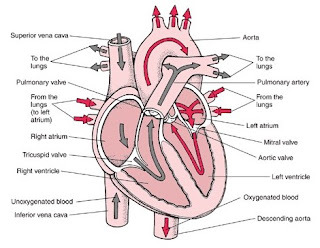 Both the inflow and outflow cuts for the right ventricle are made about 0.5 cm from the ventricular septum, with either scissors or a knife from the right atrium to the ventricular apex through the tricuspid valve and then from apex to the pulmonary artery. Open left atrium from a point between the right upper and lower pulmonary vein orifices to the tip of left atrial appendage. In contrast to the right ventricle, the left ventricular inflow tract is opened not along the septum but rather along lateral wall between the mitral papillary muscles from the left atrium to the left ventricular apex. From the left ventricular apex to the aortic valve, the outflow cut follows the junction, generally forming a gentle inverted S-shaped cut. 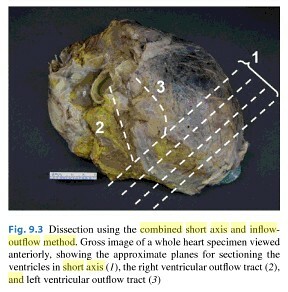 A combined approach of Inflow-outflow method and short-axis method can also be used as it allows for examination of infarcts along with ventricular chambers. Wall thickness: Ventricles and septum (Thickness of normal left ventricle and right ventricle is less than 1.5 cm and 0.5 cm respectively). Wall thickness is measured at the level of papillary muscles.